On this amazing conservation project you will have the once in a lifetime chance to volunteer with the 'Big 5' and really help make a difference to African conservation efforts. 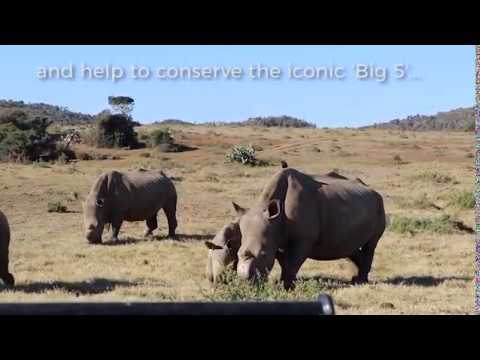 The Kariega 'Big 5' Conservation Project is set in South Africa’s beautiful Eastern Cape and this impressive volunteering project is a mere 15 kilometres from the dazzling Indian ocean. Based on a 10,000 hectare reserve, the pristine African wilderness surrounding you is home to all manner of incredible wildlife and here you will get the chance to see the 'Big 5', so be sure to keep your eyes peeled for lions, rhinos, elephants, buffalo and if you are very extremely lucky the elusive leopard! Kariega’s landscape is dominated by two rivers that have shaped and altered the vast plains and valleys you will see before you whilst volunteering on the project. These rivers are the Bushman and the Kariega Rivers: two water sources that have helped the project's animal life to grow to incredible levels since its humble beginnings when the (then small) reserve began life back in 1989. As a volunteer on this conservation project you will take part in a wide variety of activities and assist in many elements of running a game reserve, essentially becoming an “Assistant Conservation Manager.” Some of the amazing tasks you could be helping with include game capture of the 'Big 5' animals including lions and buffalo, elephant impact monitoring and even helping with tasks such as darting and relocating animals as and when needed. Here you will really become a member of the team and this is your chance to make a real difference and aid Africa's amazing wildlife. As a volunteer, you will be given elephant identification sheets as part of your role when monitoring these imposing giants. Volunteers will help the team to monitor elephant range patterns and vegetation impact, all whilst learning how to identify the different elephants at the project via the distinct markings on their ears. This helps the reserve team to better understand these animals which so often come into conflict with humans. Leopards have been unfairly persecuted in South Africa for over 350 years and the team at this project want to carefully monitor these elusive animals to best plan ways to properly aid in their conservation. As a volunteer, you will be helping to monitor the motion sensing cameras that are located all around the reserve, and you will also play a role in helping to gather and curate some of the data found on the cameras' memory cards. At this project there are a number of rhinos and volunteers play a key role in helping to monitor their numbers and what condition they are in. Rhino poaching is a huge problem in South Africa and for this reason the in country team are unable to divulge much information on the number of rhinos you will be working with, but you will be helping to ensure these magnificent animals have a future by taking notes on their movement patterns and behaviour. One of the jobs you will have as a volunteer is to closely monitor some of the kills made by the reserve's lions. This will help to provide the ranger team with valuable information about the number of animals killed by the lions, their preferred prey source, and how well the pride is doing. On such a vast reserve this task would be almost impossible without the manpower volunteers provide, so your work here is unparalleled! Throughout the reserve alien plant species are found, and as these are plants that are not native to the area they can cause major issues in the local ecosystem. It is for this reason that volunteers work to help remove these alien plant species so that the local plants the animals need to survive can once again flourish. Life on a volunteer project isn’t just about the animals as some of the behind the scenes work needs to be done too! The roads that connect the different parts of the reserve to one another are the lifeblood of the area, and without proper maintenance, none of the other crucial work that needs to be completed can be! That is where you come in as a volunteer and you will help to ensure that the roads are up to the standard they need to be. Volunteers can occasionally have the chance to assist with the capture of wild animals. Please note that this will only occur when it is needed and not just as a part of the volunteer programme, but when it does happen you will play a hands on role and assist with every part of the procedure from sedating the animal right through to lifting them onto the vehicles to be transported to a different location. This is not something you will want to miss out on! The team at Kariega go to great lengths to protect their rhinos from the dangers of poaching and as a volunteer you may be able to play a role in helping the anti-poaching team to do their job. You could have the chance to join the team on their patrols and learn more about the anti-poaching efforts, but please note that this is not a guaranteed activity. Nights spent around the fire having a braai are a big part of South African life, and throughout your time as a volunteer you will get to enjoy a braai or two with your new found friends. This is a great chance to talk about what you have seen and experienced throughout the week and to relax with some delicious BBQ food! This is an activity that may not seem exciting from the title but the knowledge of the volunteer coordinator makes this a memory that every volunteer takes away with them for a very long time. You will be taken out to admire the crisp and clear African night sky, and you will learn about all of the stars above you including how to navigate via them and where your star sign is! One of the best ways for the in country team to monitor the population and well-being of the animals on the reserve is through game drives and as a volunteer you will have the chance to enjoy this traditional African experience. Heading out onto the reserve in the back of a dedicated safari vehicle is one of the best ways to see the animals, and alongside a plethora of antelope species and other prey animals, you may be able to spot the famous African big 5; namely buffalo, elephants, lions, rhinos and maybe even a leopard! Weather and water levels permitting, you may also have the chance to take a relaxing boat ride down one of the local rivers with your fellow volunteers. As one of the more gentle activities you will participate in this is a good chance to sit back, unwind, and take in the incredible scenery along the riverside. A journey by boat really shows the startling diversity of the ecosystems that are on the Kariega reserve, so be prepared for an awe-inspiring journey. This activity is done in collaboration with the University of Cape Town’s Avian Demography Unit and you will be part of a team who will be preparing a catalogue of the birds, bird numbers and their breeding status on the reserve to learn more about them. This is important work as birds are often a good indicator species for any problems that may occur in the ecosystem. Please be advised, although we are able to offer a 7 night option, a minimum duration of 14 nights is recommended for a more in depth experience. If you can only join for 7 nights there is no guarantee that you will be involved in all the activities listed. After arriving at the project site from the airport you will be given time to settle into the volunteer accommodation and shown around the volunteer house where you can familiarise yourself with the project facilities. You and your fellow volunteers will be cooking for each other on this project, so your first dinner will be a fantastic chance to see who is a whizz in the kitchen! You will enjoy breakfast in the morning before heading out to begin the day's work. Any of the mentioned activities could be on the agenda so be prepared to get stuck in! You’ll have lunch at around 1pm before heading off to complete the afternoon's activity. Volunteers work 8 hours a day on this project, so at around 5pm you will head back to the volunteer house to perhaps take a dip in the pool or enjoy dinner. The evenings are at your leisure so you can do as you wish! Unfortunately, today is your last day on the project! After saying your fond farewells to fellow volunteers and project facilitators, you will make your way back to the airport to begin your journey home, or commence your onward travel plans. Wherever you travel next, you can be sure that you are going with some incredible memories. You are able to join this project on any Monday throughout the year but it is closed over the Christmas period. To secure a place on this project, a deposit of £195 is required at the time of booking, with the remaining balance due any time up to 60 days prior to your start date. 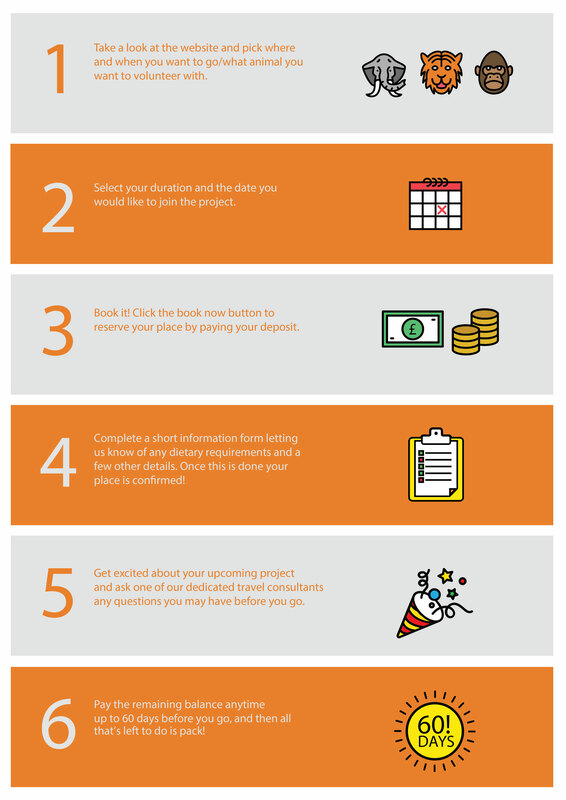 Select a duration below to see the project start dates. Please note that the maximum age for joining this project is 60 years old. The Kariega Game Reserve measures an impressive 10,000 hectares and with this size of land comes a series of issues that must be tackled. The volunteer programme was introduced here to ease the burden on some of the rangers at the reserve and the work that has been completed so far by the volunteers has made an immeasurable difference to not only the reserves animals but also the local community as a whole. We can’t wait to see what the future brings for this amazing volunteering project and how our generous volunteers will make a lasting impact to the fascinating, but vulnerable species found here. The accommodation on this project is called Ocean View, as you can see the Indian Ocean in the distance from right outside! You will be staying in a recently renovated house on the reserve and will have full access to all of the facilities available here throughout your stay. The volunteer house consists of five spacious twin share bedrooms with en-suite bathrooms, a fully equipped kitchen with a washing machine, a very comfortable living room and a communal dining area to enjoy meals in as well! Outside the house, there is a plunge pool which is perfect to take a dip in after a hot and hard day’s work and an area dedicated to the braai, a traditional South African BBQ. This area is the perfect place to admire the galaxy of stars that appear above your head every night! Food is provided on this project but volunteers will take turns to cook on a rotational basis, who knows, this could be another skill you pick up whilst on the project! All of the food you will need for all meals will be found in the house so you will never go hungry! There is also the chance to enjoy a BBQ outside dependent on the weather, which is a very communal meal and a great chance to test your Braai skills! We recommend that you come with a moderate level of fitness as the days are busy and you will be involved in a whole host of activities! 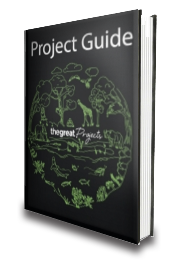 In terms of skills, all we ask is that you arrive with a willingness to get involved with tasks and a dedication to the ethos of the project, as well as a respect for the enchanting wildlife and the committed project staff with whom you will be working. The vaccinations required will depend on the individual medical history of each volunteer. We recommend that you consult with your GP regarding your own immunisation needs as this will ensure you are protected and prepared to travel. In conjunction with this, we would recommend that you check Fit for Travel’s website for more helpful information on what you need to do before your departure. On this project nearly all the activities take part all year round, meaning the only factor that may affect your decisions on when to volunteer is the weather. In the coastal region where this project is situated there is not a big difference in day time temperatures throughout the year. These can reach 35°C (74°F) but average 20 – 25°C (68-77°F). Night time temperatures, however, are much colder in June, July and August. During this period (which is winter in South Africa) temperatures can drop to between 5 and 10°C (41-50°F). The rest of the year they average between 13 and 18°C (55-64°F). Whilst it does not rain heavily for long periods of time, February and March are definitely the wettest months, with October and November being extremely dry. Community work however is the one activity that is affected as schools are closed between mid-December and approximately the 7th of January. Therefore, if you are keen to get involved with the community projects you should avoid volunteering during this time. The easiest way to get here is to arrive into Johannesburg (O.R. Tambo International Airport), and then book a connecting domestic flight from Johannesburg to Port Elizabeth. The project is approximately 2 hours (140 kilometres) from Port Elizabeth Airport. Your flight will need to arrive into Port Elizabeth on your project start date before 14:30 as this is the latest time a transfer to the project can leave. If you are unable to arrive before this time on Monday, you will need to stay in Port Elizabeth the night before the project start date (Sunday) and you will be collected from your accommodation in the morning. You will need to tell us where you are staying so that a transfer can be arranged. On your final day you will need to book a flight that departs after 12pm as the earliest available airport transfer is at 9am. Transfers are arranged by the in-country team but they do incur an additional cost. A one way trip from the airport to the project site (or vice versa) costs R750 per person, or R400 per person if there are 2 or more volunteers sharing the transfer. The project manager will attempt to arrange for volunteers to travel together to help lower the costs, but please have the money on hand to pay the driver directly for each journey. Holders of UK, most other EU countries, Australian, Canadian and USA passports are not required to obtain a Visa in advance for South Africa. Upon entry, you will be issued with a 3 - month permit (at no cost). Make sure the correct date and length of stay in the country is entered onto your visa when at immigration. If you are travelling from Albania, Belarus, Bulgaria, Cyprus, Croatia, Hungary, Poland, Russian Federation, Romania, Slovakia, Slovenia, Algeria, Angola, Comoros, China, Egypt, Guinea, Ivory Coast, Kenya, Mexico, Madagascar, Morocco, Mozambique, Paraguay, Rwanda, Tanzania, Thailand, Tunisia or Vietnam, you will require a Visa and should consult your nearest South African embassy. Please note that the South African immigration policy states that you will need at least two empty pages in your passport and at least six months validity to enter. The currency in South Africa is the South African Rand (ZAR). The exchange rate is approximately 1 ZAR = £0.06, US$0.07 and €0.07. Please note exchange rates are subject to change. Fantastic Trip! Would Definitely Recommend! My favourite moment was spotting a black rhino - this is something I'll never forget. Too many memories to mention - the group were great, the coordinator, Jarratt was really knowledgeable and brilliant, being only a few metres away from rhinos, elephants lions, etc etc being on the reserve, I could go on! I missed out on the game capture activities as was only there a week, and the weather was a bit rainy so limited some of the clearing/maintenance activities. Would def recommend and already planning on where my next one will be! South Africa is home to a whole host of amazing wildlife including the synonymous springbok, but it's most famous residents in the world of wildlife are the "big five" animals. People travel from all over the world to see the buffalo, elephants, lions, leopards, and rhinos that roam the vast savannas and bushvelds of the country, and as a volunteer you will have the chance to see these animals and many more during your time in South Africa!